Graf Grannus has an exceptional pedigree combining different valuable bloodlines. His sire, Grannus, is a true star when talking of sires producing international jumpers. Many teams are based on Grannus progeny. Grannus was a successful show jumper ridden by Guido and Ulrich Klatte with wins in 1.5 classes. 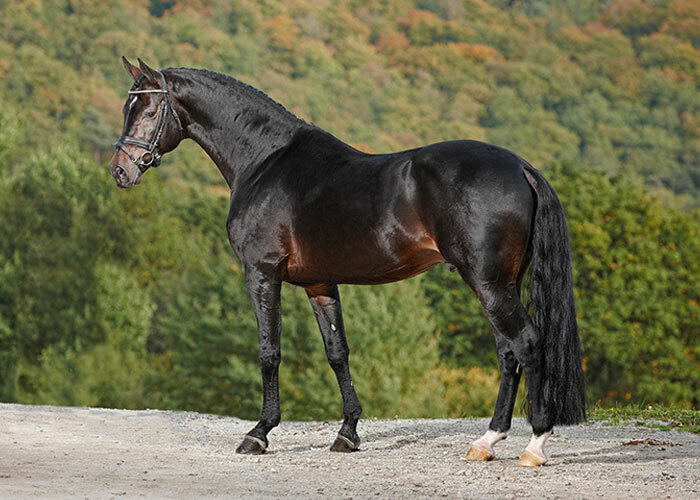 Graf Grannus’ dam, the black Goldmadel was first used for breeding and then changed to the Luther stables where she too won advanced jumping competitions. Her sire Goldowe is one of the last approved sons of legendary Gotthard-son Goya whose dam is by the famous sire Domspatz. There is a triple inbreed on Gotthard in Graf Grannus’ pedigree and Gotthard’s sire Goldfisch 11 is to be found another three times which guarantees a secure heredity of jumping potential. Here is a stallion with enormous jumping ability, and excellent rideability. 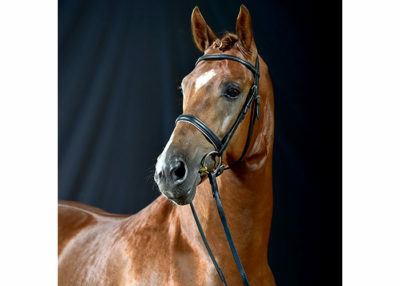 He was placed second in jumping, fifth in dressage and third overall at the 1991 Stallion Performance Test, proving his quality and versatility. He has large eyes, strong neck, and solid well-muscled conformation. He has excellent character, together with clearly well above average ability in all respects. 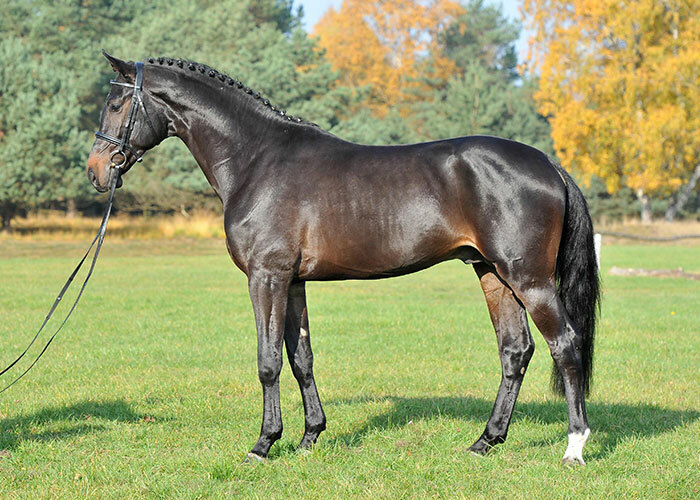 This impressive stallion Graf Grannus is one of the finest representatives of the Hanoverian G-line, which is always a guarantee for performance ability, especially for outstanding jumping power. His offspring stand out for their excellent jumping technique and jumping scope. He had his first breeding in 1992. His son Golden Champ was the champion of the licensing at Verden 1995 and Ginsberg was the vice champion of the Verden licensing 1996. From his first batch the colt Galway was sold for DM 13,000.00 at the Verden foal auction and Graf Top 1 seems to have developed to be a maker of showjumpers of the very highest order. His progeny impress by their great showjumping ability year in, year out and are always in the front ranks at the Hanoverian showjumping championships on the occasion of the Dobrock tournament and at the federal championships. The approved Glenfiddich made his way into the international competition sport by way of Marco Kutscher and Ludger Beerbaum. He has 21 licenses sons, 51 state premium mares, and 424 main stud book mares, and 100 auction horses. Winning sum of progeny is Euro 948,773,00. He is a big improver in jumping. 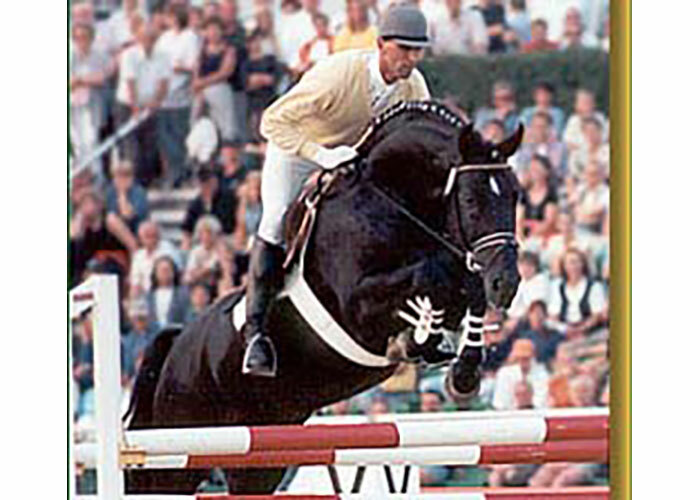 Graf Grannus was Hanoverian of the Year in 2004.